As a veteran parent for the past thirteen years, the one thing that has haunted me the most about organizing kids is toy storage solutions. I know this sounds silly, but it's downright hard to organize toys. Yeah I said it, but here I am, a mother of four with an MBA, and I've had a hard time getting toys organized. So, what can I offer you? A lot, because I will share with you what has worked best through much trial an error... So, here goes, the do's and don'ts for toy storage solutions. Don't use toy storage chests or toy boxes. These are clutter magnets and terrible toy storage solutions because kids have to dump everything out to get to what they want. Toys get tossed in and out of these boxes only to come out broken or forever mangled or lost. Do use a simple strategy of keeping the most favorite toys out and within easy access on open shelves. This is one of my favorite toy storage solutions because kids can get what they want by themselves and put it away too. 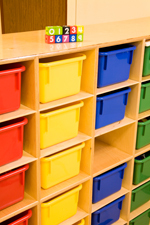 Do keep their other toys categorized and stored in wicker toy storage baskets or rolling carts. Every toy in our house is visible and organized by category. The only toys that I store in closed toy storage are stuffed animals that are stored in a big wicker laundry hamper. The stuffed animals are easily accessed, pulled out, and can be thrown back into the laundry hamper with no damage or loss. Try doing that with a Tonka truck and you'd tear up the toy or the hamper. Do use under the bed storage. These storage boxes work great for all those McDonald's toys your kids don't want to part with. They also work great for matchbox cars and their tracks too. Let your imagination on these great storage devices be the limit. Do rotate toys to keep them "new" in your kids minds. My kids have way too many toys so I rotate toys. See the heading under Toys on my page on Tightwad Tips to Raising Kids. I store some toys away in a closet for about six months, and then bring them out again usually on a rainy day when everyone has cabin fever. Do baby proof toys. Since I have kids at different stages, it can be hard to keep little objects out of the baby's mouths. My solution is that if it can fit inside a toilet paper tube, then it gets put up in a special box (shoe box that my toddler has decorated). My toddler can play with these when the babies are sleeping. See Childproofing Your Home for excellent tips to childproof your home. Do declutter regularly. Do a toy clean out, which is one of the hardest toy storage solutions since kids want to keep everything. Ideally the best time for this is before birthdays and Christmas, but usually the most I have time for is before Christmas and that seems to be sufficient. Go through toys before the holidays start, usually sometime between Halloween and Thanksgiving works well. You'll want to go through the toys yourself and sort into piles of keep and toss. Toss out anything that's broken or missing parts. Go through the keep pile with your kids and decide what you're going to keep and what you're going to donate. Explain this process to them before starting. Let them know that you're making way for new toys, and less fortunate children are going to receive their old toys. If that still doesn't work, then do what I do, and tell them their toys are tired and need to take a nap, then ignore the screaming. Place these toys in storage for six months, then pull out and see what they are still interested in. Don't store toys all over the house. I restrict toys to two rooms in the house. The game room and the kid's bedrooms and that's it. That's not to say that toys don't migrate to other rooms once in a while. If that happens, I explain to everyone that any toys found outside their bedrooms or the game room by the end of the week either become mine or are tossed. I have followed through on this threat twice and lingering toys are no longer an issue. Don't limit toys during kid's playtime. I read somewhere to limit the amount of toys kids have out at one time. What fun is that? And if you have organized designated spots for everything, clean up should be a breeze. Do make a bag for grandma's house. If you're running out of room storing toys your kids don't want to part with, then create a bag of toys for grandma's house. This is an excellent toy storage solution to send a bag of toys to grandma's for kids to play with at her house. Do maintain toy storage organization. Buy rolling carts. At night or before naptime, these are fun for kids to roll around to pick up toys. Do designate clean up times such as before a nap and bed time. This may seem like excessive clean up, but it works wonders for you having a clean home when the kids are down for a nap. This is entirely based on your schedule and what works for you. For instance, you'll want to look at your schedule and fit clean up time appropriately. No one wants to run errands and return to a home strewn with toys. Do make it fun. This is so important as kids naturally don't want to stop playing and clean up. If you make it fun, you will make your life much easier as tantrums will be limited. My three year old loves to sing and clean up. Even my nineteen month old joins in and sings the clean up song… although she hasn't mastered cleaning up yet. As a side note, don't expect much from your kids until they reach three years of age. As I mentioned before, my nineteen month old loves to join in and sings the clean up song, but forget about being very helpful cleaning up. She's just too young for me to expect her to really help. Having said that, a critical part of toy storage solutions is to start early and teach kids to clean up. I continue to encourage my nineteen month old and praise her when she does clean up a little bit. And, you know what, something magical happened when my son turned three this year, he now cleans up after himself! He may not always want to, but with encouragement, he always does. The point I'm trying to make is that I started early teaching my kids to clean up after themselves and it is now paying off in their young lives. With these toy storage solutions, your kids will learn the valuable life lessons of cleaning up after themselves and good organization. The end result is you'll all be happier!